Melted chocolate and caramel are drizzled on pecans to make pecan turtles. People who enjoy sweet yet crunchy candy will enjoy eating pecan turtles. This treat is made by taking pecan halves and then drizzling them with melted chocolate and caramel. 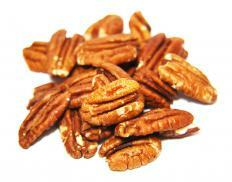 The candy pecans are then refrigerated until they are solid. They are known as turtles because the candy resembles the shell of a turtle after it is completely set. Often enjoyed as a snack, they are also popular candies to give as gifts. In order to make pecan turtles, an individual must first take pecan halves and arrange them in the shape of a turtle. Seven pieces are used, two for the body, one for the head, and four to make the legs. This is typically done on a cookie sheet or on waxed paper. Some people like to spray the surface with non-stick cooking spray before placing the pecans on it, as this helps keep them from sticking after the candy is finished. Soft caramel candy and chocolate are then melted in a double boiler. Sweet baking chocolate or chocolate chips can be used for this purpose. Unsweetened chocolate is not suitable because it will cause the finished product to taste bitter. These ingredients are cooked until soft and smooth, but they should not be runny. After this, the mixture is drizzled over the center of the pecans, leaving the head and legs uncovered. Pecan turtles should be placed in the refrigerator until the chocolate mixture has completely hardened. This normally takes at least 30 minutes. Even though the final step in making candy pecans involves chilling, this confection should be brought to room temperature before serving. It is fine to store them at room temperature, but they should not be allowed to get warm, because it could cause the chocolate and caramel to melt. Many people like to eat pecan turtles as a sweet snack. They can also be enjoyed with a dip of vanilla ice cream when it is hot outside or a cup of coffee when the weather is colder. This treat is very high in calories, so people should avoid eating more than one or two of these candies at one time. Pecan turtles are often given as a gift, especially at Valentine's Day or Christmas. Entire boxes of these candies might be purchased, or they could be part of a mixed assortment containing other chocolate or caramel goodies. They are a sweet and tasty candy which can be enjoyed by people of all ages, no matter what the occasion. What Is an Empire Biscuit? What is a Black and Tan Sundae?